A video swallow study is used to look at your swallowing. The study is also called a videofluoroscopic swallow study (VFSS) or a modified barium swallow. You can think of the study as an X-ray movie of your swallowing. It shows how your tongue, mouth and throat move, and how food and drink move through your mouth and throat. 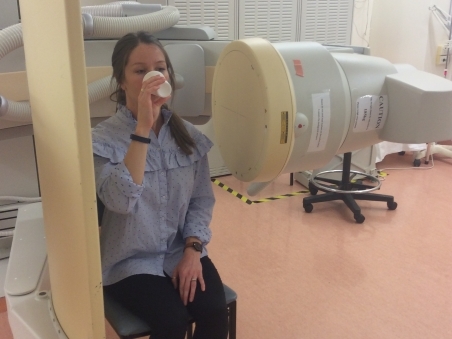 The study is used to investigate swallowing problems and to help decide how to manage them. The study is done by a speech language therapist in the Radiology Department of either Christchurch Hospital or Burwood Hospital. Your appointment letter will tell you which hospital to go to. How do I prepare for my swallow study? Be prepared to talk to the speech language therapist about the foods and drinks you find most difficult to swallow. Apart from that, you don't need to do any specific preparation. You can eat and drink as normal, before and after the procedure. What can I expect during my swallow study? The speech language therapist will give you small amounts of different types of food and drink to swallow. These will be mixed with barium so that they can be seen on the X-ray. Barium is tasteless but it may feel chalky in your mouth. The speech language therapist will record the study so they can analyse your swallowing patterns after the procedure. You can sit or stand for the procedure and you can stay in your own wheelchair if necessary. You can discuss any questions with your speech language therapist or doctor before your examination. A swallow study usually takes 15 to 20 minutes. What happens after my swallow study? The speech language therapist and radiologist will both write reports. They'll send copies of the reports to the other health professionals involved in your care. They'll send you a copy of the speech language therapy report with any recommendations. The speech language therapist may recommend changes to what you eat and drink. They'll also tell you about any swallowing strategies that may help you eat and drink. Written by Speech Language Therapy Department, Christchurch and Burwood Hospitals, Canterbury DHB. Adapted by HealthInfo clinical advisers. Page created August 2017.